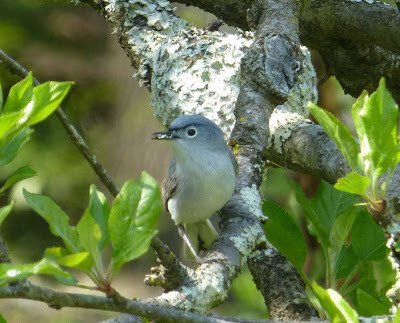 A resident of the neotropics, the blue-gray gnatcatcher migrates to our neck of the woods for the summertime and thus gets a spot as our June bird in this year’s 12 Months of Birding at the Inn series on the blog. The gnatcatcher is a tiny gray bird, with a long white-edged tail and dark streaks above its eyes that make it look like the gnatcatcher flew straight out of the Angry Birds game. However stern it might appear, the Blue-gray Gnatcatcher is actually an entertaining bird with a raspy call that sounds like speeee, speeeee, and a warbly little song. The gnatcatcher pictured here arrived to our apple orchard in late April with a friend and they built a nest on one of the apple tree limbs, in between flying around the tops of the branches looking for insects. 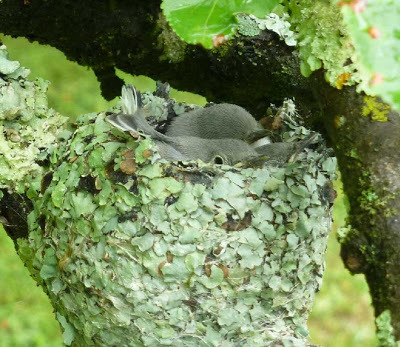 By late May, they had three baby gnatcatchers, and it was fun to watch them slowly outgrow the nest, reminding us a little bit of the innpugs when they try to squeeze onto one section of our office couch at once. Getting a little bit crowded! The Inn on Mill Creek Bed & Breakfast is a site on the North Carolina Birding Trail, a driving trail of great birding locations in the state. 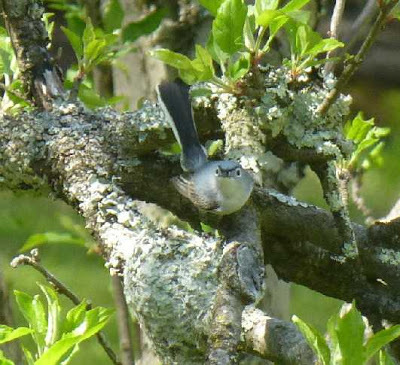 So be sure to watch for the Blue-gray Gnatcatcher and many other migratory species in the summertime when staying at the Inn. And Local residents and visitors to the area who are not staying at the Inn can arrange a time to do self-guided birdwatching at the Inn by advance appointment: e-mail us at info@innonmillcreek.com or call 828.668.1115 (9:30am-9pm EST) to plan a visit.